Her friends house dates from the early 1900’s. Most of the property has had the top soil hauled away and new soil brought in, however, there was one small area of undisturbed wetlands where they concentrated their efforts. The area wasn’t producing much except for a bunch of beer cans, but then Stacey said she got a “very loud signal”, and assumed it was another beer can, but since she is learning her machine, a White’s XLT, her motto is to dig everything. 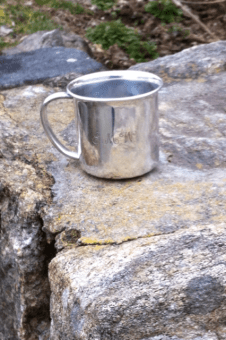 It’s a good thing too, because at about 6” down, what she thought would be another beer can turned out to be a most spectacular Sterling silver cup—How awesome is that?!! And not only did she uncover an exceptional find, she found it while showing someone how to detect. I guarantee her friend made a decision to purchase a machine that day! I can’t say it’s beginners luck with Stacey, because to see her in the field, it’s obvious the girls got skills, and a natural talent for the hobby. I think her E-Trac fund will be fulfilled by Summer. Congratulations to you Stacey—You’re a true Detecting Diva! Look how this cup cleaned up! Your friend made a great find……if you have the patience digging all the targets certainly pays off. Wow, nice find….send my congrats to Stacey. Excellent … not the usual find in the UK. Thanks for all the compliments Allyson! I’m so addicted right now and constantly look for sites as I drive anywhere these days! Can’t wait to learn more and hopefully find more! I can remember that excitement quite well Stacey. 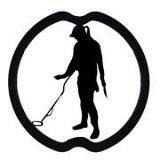 It’s a great pastime, and the simple act of looking for sites as you mentioned above is a big part of it. When I started out “history” took on a whole new meaning. I have been to the historical society in my town more in the last two months than the whole 7 years I’ve lived here! Researching the heck out of this place! Ha ha–I spent every lunch hour at the library for months, and every day off at the historical society. Totally relating. awesome find. 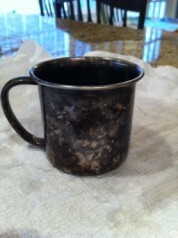 lovely cup, btw., looks modernist..
It’s a nice find, unfortunately though, it wasn’t my find–but Kudos to Stacey.